This short HowTo discusses setting the Peripheral Repository Path. You can set the path when creating a new project, or during a project session. 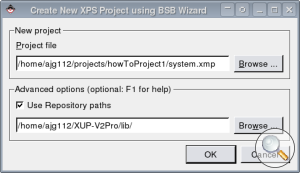 When creating a new project, you can set the Peripheral Repository Path. When opening an archived project, it is possible that the originally set Peripheral Repository Path no longer exists. In this case you'll need to reset the path. Select Project->Project Options. 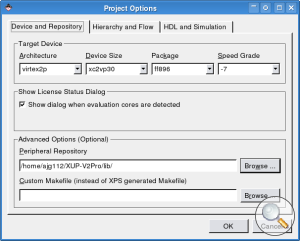 Within the Device and Repository tab there is a text box to set the Repository Path.